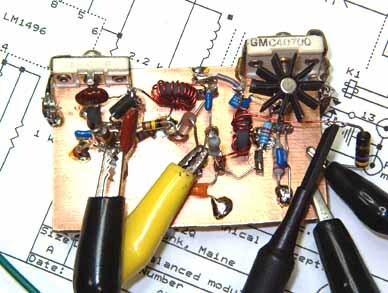 Here's the nearly completed SSB generator board, with mic. 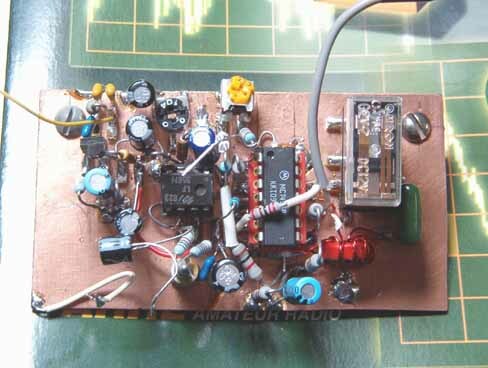 amplifier, LM1496-based balanced modulator, and DIP-style TX/RX changeover relay in place. 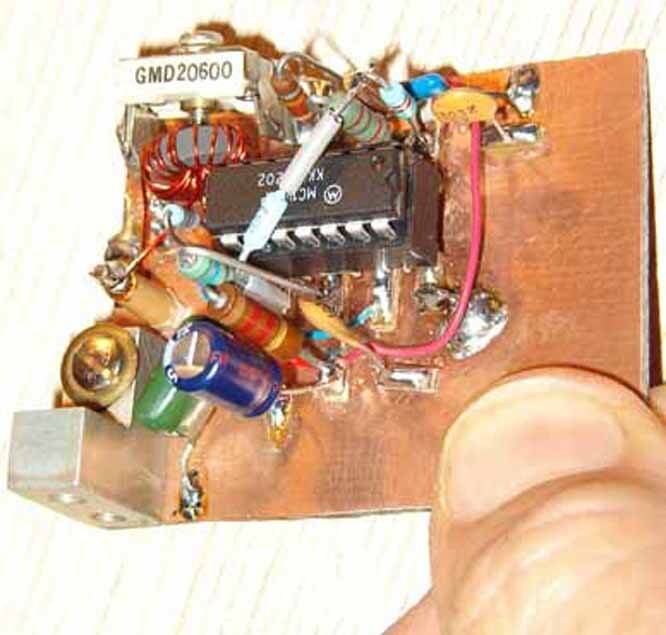 Not shown (added later) is a 1N4001 counter-EMF diode across the relay coils, and additional signal and DC routing. This photo shows the SSB generator board in place in the aluminum TX chassis, with signal and DC wiring to rear-panel I/O connectors in place. 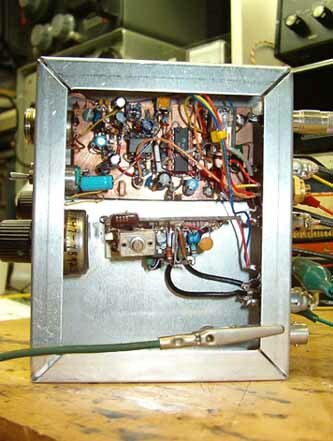 The toggle switch selects CW (carrier) or SSB operation, with the knob adjusting a pot to set the level of the DC offset for the carrier level, or microphone amplifier audio. Either can feed the balanced modulator. 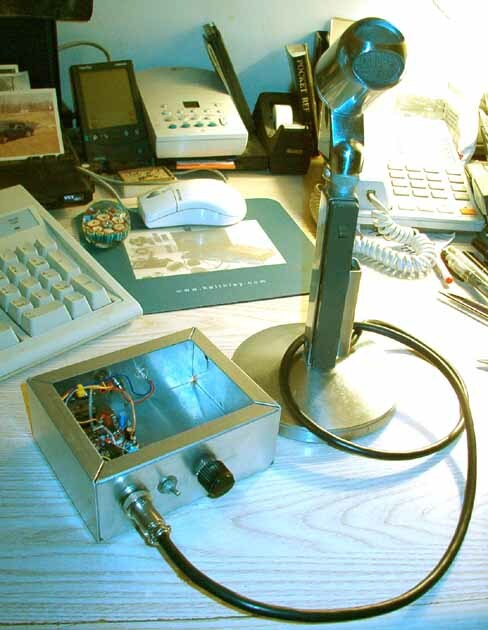 Connecting a microphone and listening to the signal on the shop receiver (an R-392 tuned to 9-MHz) is a satisfying experience. The DSB audio sounds crisp and clean, with good carrier suppression (some BFO radiation and suppressed carrier can be heard on the test receiver). 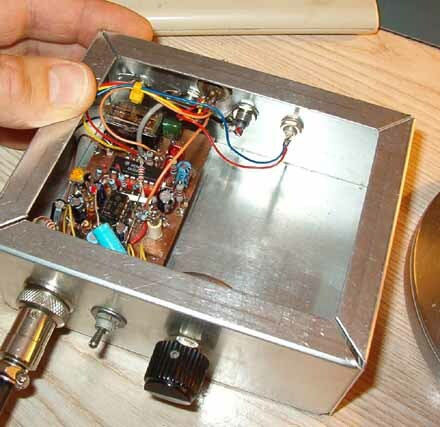 Here's a photo of the TX-mixer module with the transmitter-mixer board installed. 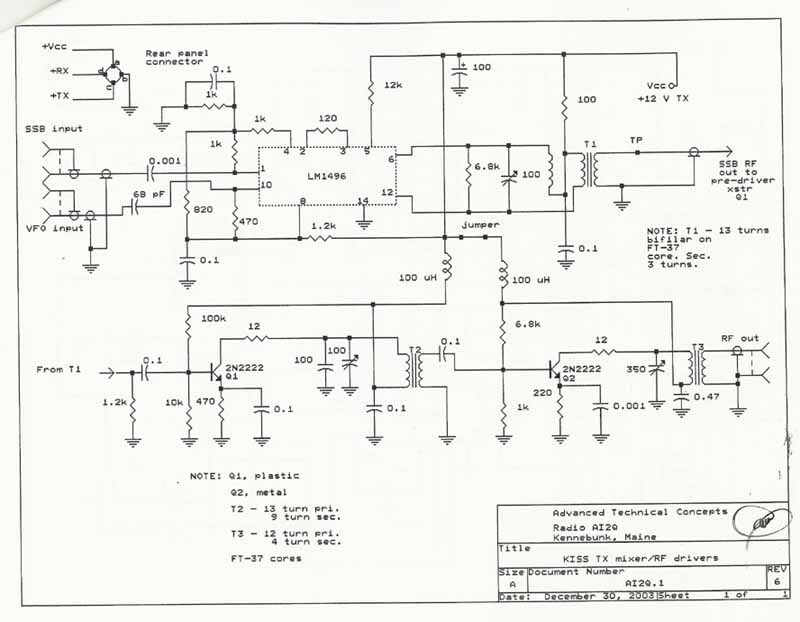 Click here to see an image of the TX-mixer board. 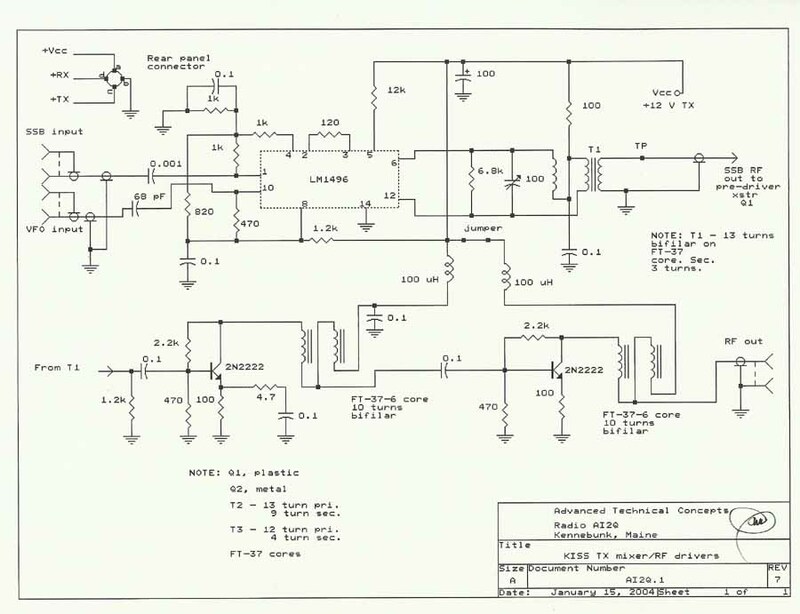 Click here for the schematic of TX-mixer and RF pre-driver stages. Click here to see the improved un-tuned broadband version of the pre-driver stages. Next to be installed will be the RF pre-driver stages, comprised of a plastic 2N2222 followed by a metal-encased 2N2222. Here's the TX pre-driver module, with clip leads and scope probe attached for preliminary testing. The 2N2222 on the left is the plastic-packaged 1st linear pre-driver. The metal 2N2222 on the right is the linear 2nd pre-driver, fitted with a small black snap-on heatsink. It's required in order to dissipate the heat from the inefficent Class A stage. The carbon resistor on the right-hand edge of the board is a temporary dummy load. Click here to return to home page. Click here to return to previous page.